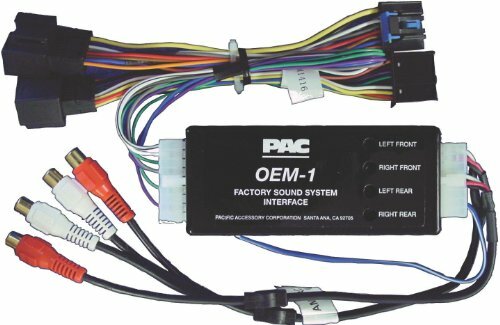 OEM-1 with a vehicle specific harness plugs into the vehicle's wiring and provides a stereo RCA audio output for adding aftermarket amplification. Audio output level is controlled by the volume of the factory radio. output of AOEM-GM1416 interface and will be amplified through the aftermarket amplifier. or vise versa. Turning on rear entertainment console controls will make the rear outputs of the AOEM-GM1416 interface play the second audio source. set the warning chimes to lower volume.